Polish Hound: Mail-time: A Haul to Gloriously Conclude My No-Buy! Hey everyone! I've solved my lighting / speedlight dilemma for now (I picked up a Yongnuo YN-560 II, if you're curious, and so far it's doing wonderfully! ), so I'm finally able to swatch properly and share this glorious, glorious mail time* with you! *Also, ugh, I loathe the word "haul" in relation to shopping / consumerism. But,what else do you call this?! I know you haven't seen Ham so much on the blog lately (although, he's been on IG), so I took many, many photos! Some kind of canine/ nail varnish still life? I have no idea what this is about. I asked him if he thought carrots were yummy. I was trying to get him to lick his chops! It is the long-suffering expression + guilt-trip ray combo! And, it was super effective: many carrot pieces ensued! At any rate, this mail-time is really three separate mail-times/ orders! They did happen to arrive all on the same day though, which was a lucky coincidence, as I didn't place the orders at the same time! It did make for an epic mail day for me! 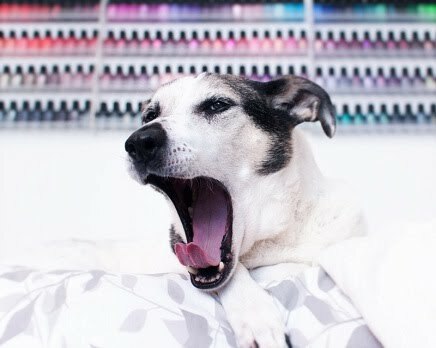 So, first, the real straw that broke the camel's (no-buy's) back was the Emily de Molly restock on NailPolishCanada.com. I really couldn't pass up the opportunity to own Cosmic Forces at long last (especially after seeing it in person when I was able to snag it for my Santee during this polish swap). Plus, there were new colors recently released! How could I say no?? Luckily, the restock almost perfectly coincided with the official end of my no-buy (end of August). All of these, other than Tread Lightly (already swatched here), are long time lemmings of mine, so it was a nice feeling to finally have them in hand! I do want to mention that NailPolishCanada has free shipping to the US for orders over $50. That's a good deal when you're stalking an EdM restock! Also, they usually ship orders ridiculously quickly! Next, and equally as exciting, is the order I placed from Color4Nails.com. I may be slightly oblivious, but I just learned that they carry Picture Polish, so I had to jump on that since I'd been eyeing a lot of the new collaboration shades. It was my first experience with Color4Nails, and it was a good one! I've already swatched Unicorn and am processing the photos, so stay tuned for that one! I wore Unicorn for about five days, so that should tell you something about how much I ended up adoring it! Yum! I'm excited to wear all of these! Last, I made an order from 8ty8Beauty Supply. If you can get past the janky name, I recommend this e-tailer. Shipping is not calculated until after you've checked out, and that is really the only downside I can see. My order's shipping charge ended up being $12 even, and I ordered 11 polishes. That's a bit steep, but their polishes are much, much cheaper than anywhere I can find these brands in person. The three polishes farthest to the left are from the new Fall 2014 collection called Smoky. Sparkling Garbage is one that I was initially not attracted to, but I kept seeing people rave about it, so I had to satisfy my curiosity! I can tell you that it is gorgeous in the bottle! I have to say that Orly is really bringing it lately! I've liked the brand for a long time, but they've really been coming out with unique, quality colors, especially for a commercial brand! China Glaze- Grass Is Lime Greener. Grass Is Lime Greener is from the Spring 2014 City Flourish collection, and I'd initally passed on it, but it grew on me. What can I say?! These two are from the recent The Giver- inspired collection. I was intrigued by the grey, since many people are describing it as blue-leaning (and it is), but I feel like I probably already have something similar. Boundary of Memory, on the other hand, is an amazing, dense glitter! It's like the brown-bronze version of China Glaze- Skyscraper from the Fall 2011 Metro Collection, which I own and love. I also picked up four shades from the new China Glaze Fall collection! To be honest, this entire collection appeals to me, so it's a wonder I was able to narrow it down to four! I've already photographed swatches of these guys, so that post is also in the works. Spoiler Alert (not): Choo-Choo Choose You is my stand-out favorite! And, that's all folks! I have a lot of new stuff to try, and should probably go on another extended no-buy, stat! Have you guys received any interesting polish in the mail recently?? Hi Ham!!! This entire post is making me drool. I think Color4Nails is my favorite e-tailer! Growing up, we had a German Shepherd, Holly, who loved c-a-r-r-o-t-s (we had to spell out or she went berserk). For 14 years, she got 2 carrots a day. She was a good girl. Your shopping spree (instead of haul?) is great! I didn't know about the those e-tailer so I'm checking those out. I've seen the Choo-Choo Choose You in person...now I'm thinking I need to get it. Haha! It's about the same around here. Did you know Ham is half German Shepherd? I love GSDs! They are full of personality! I'm still wearing Choo Choo at the moment, and it's great! Monet's Garden is one of my most favorite polishes and I can't wait to see your swatches of I Choo-Choo-Choose You! Awesome new colors you picked up! Ham wins the most adorable dog award....every single time :) Nail polish additions? Nail mail? Not sure what you could use besides haul, I don't really like saying haul either but I'm also really weird about spending money. I can't wait to see swatches of the Emilys and the Picture polishes, they look amazing!!! So much goodness!! I too snagged some PPs from color4nails. I chose Forget Me Not and Bette (already have the Ozotic versions of Pandora and Eyre, tho I still wanted them). I will definitely get Unicorn and Fools Gold another time, looking forward to that post! I do super love Orly Sparking Garbage btw....I have two! And those China Glazes look good too... :D:D:D !!!!!! Wow, wow, wow! I wouldn't know what to start with first, great haul! Ooooooooooh there are a few in there that I absolutely love! Monet#s Garden and Serenity are just plain amazing! Also, I have definitely admired PP Bette, but saved it for another day! Thank you! And, haha! I don't even think my boyfriend noticed I didn't buy polish for three months. Hmph. Haha, thanks Erin! I'm gonna stick with "nail mail" I think! That's exactly how I feel! I'm just going to start slowly swatching them I think.